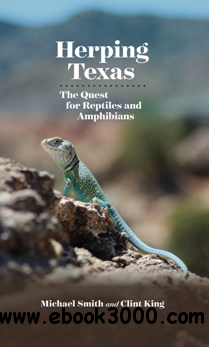 In Herping Texas: The Quest for Reptiles and Amphibians, Michael Smith and Clint King, expert naturalists and field herpers, take readers on their adventures across the state as they search for favorite herps and rare finds. Organized by ecoregion, Herping Texas describes some of the state's most spectacular natural places, from Big Bend to the Big Thicket. Each chapter contains photographs of the various snakes, lizards, toads, and turtles Smith and King have encountered on their trips.